We have a very young couple here with Liam, one of the stars of the Hunger Games a tender 22 year old, and child star, actress and pop singer Miley even younger aged just 19. Liam born 13th January 1990 in Melbourne, Australia is a an ambitious Capricorn with a flamboyant Leo Moon, and it seems that Miley was born in Franklin, Tennessee on 23rd November 1992 at 6.37hrs, the time mentioned a few days ago on Twitter. Astrotheme now quotes this time although I do have to be a little careful of the veracity of this information, as Astrotheme often does not check sources well. 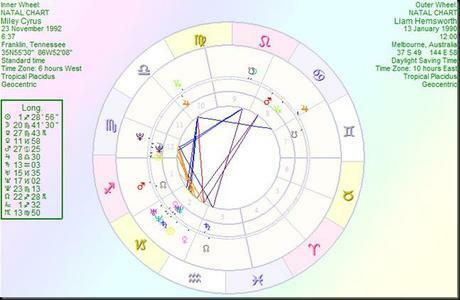 Miley has a Sagittarian Sun and a Scorpio Moon, made that much more intense by a conjunction to Pluto. Right, first off we have Liam’s Sun sextile to Miley’s Moon which immediately says to me that they are good friends and best of buddies. This is a nice complementary aspect and brings a harmony between them which can override quite a lot of more difficult ones. The same goes for a sextile between Miley’s Sun and Liam’s Venus. This is very friendly and fun and they will enjoy each other’s company. As for compatibility of signs, the Capricorn Sun of Liam is far more goal orientated than Miley’s Sagittarian one which is more playful. Liam will be the realist and Miley the optimist, however this can work out so long as Liam does not curb Miley’s enthusiasm for life. In a way, looking at the position of each Moon we have the opposite problem in reverse, as Miley’s secretive and very emotionally charged Moon in Scorpio is quite insular in nature in comparison to Liam’s outgoing Leo one. Can they square the emotional circle here? Because we do not know Liam’s birth time, it is possible that his Moon opposes Miley’s Saturn and squares her Moon/Pluto conjunction. This is a really interesting potential connection which could be emotionally highly charged and yet difficult to deal with as Miley’s Aquarian Saturn would lay down the law to his light hearted and yet proud Leo Moon. Would she hold him back and maybe frustrate him emotionally? The key is often communication in a relationship, and with Liam’s Mercury in Capricorn and Miley’s in Scorpio we have an Earth and Water mix which frankly is not bad. Liam’s Sun makes a wide sextile to Miley’s Mercury, so we do have a line of communication here. Liam’s Mercury is conjunct Miley’s Venus/Uranus/Neptune conjunction which is very inspirational and creative, there will be no end of ideas for the future flowing between them. I notice that Liam’s Mercury/Neptune conjunct’s Miley’s Neptune so there is a possibility for a bit of deception going on, although more likely on Liam’s part than the other way around. Liam’s Sun and Venus both oppose Miley’s Cancerian Mars which is invigorating and competitive too. These two will love each other, but there is the potential for arguments and lover’s tiffs too. Jupiter squares Jupiter and Miley’s Jupiter also squares to his Neptune, Mercury and Saturn and trines his Venus, so I can imagine that they will between them be a generous and very idealistic couple and could spend fortunes on each other. Have you seen the the engagement ring, only 3.25 carats?!!! The composite or relationship chart shows a longer term view of how they will get on. Straight away we have optimism here and no little luck. We have a lovely trine between Sun/Mercury and the composite Jupiter so this is an expansive, optimistic & high spending couple who will want to travel and enjoy life together. The composite Moon is square to the Sun which adds a bit of spice to their potential marriage. Yes they are different people working on different levels, but this can provide a nice tension between them to keep each other on their toes. The Moon also sits in conjunction with Mars and this elicits very strong feelings between the two. Remember what I said earlier about their natal Mars Venus opposition. This is a highly charged connection with can veer between love and hate, and this conjunction is square to Uranus which fires the passion up an extra couple of notches. If things do blow up, they will blow up big style!! Mars squares Neptune which shows we have two egos at work who will potentially compete against each other, each fearing that the other will outdo and overshadow each other. This can weaken the union and it will be something that they will have to guard against. These potential problems can be overcome though. 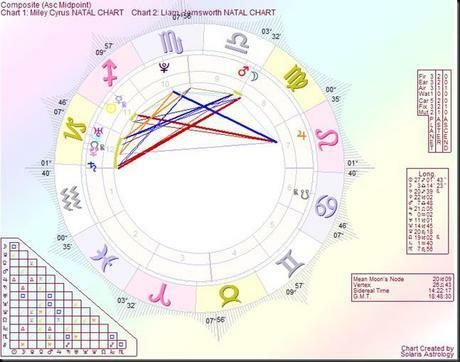 A key to this chart is the Moon/Mars conjunction which is trine to Saturn. This is a wonderfully stable influence that can reinforce any love and will tie them together emotionally. This is a real indicator of a serious partnership and of two people who really want to make a good job of being together. The same goes in a way for Venus conjunct Saturn. This does cool the emotion over time, but also adds a permanence to their relationship. This is a steady as it goes type of connection. If they are looking for long term raging passion, then it is not to be found here, but if their idea of marrying is to have a stable family life, then they have a decent chance of having it. Venus conjunct to Neptune is very friendly and warm and Venus sextile to Pluto provides a depth of emotion and intimacy that will change both of these two people I think for the better. Finally of course, these are two famous people who are engaged to be married and the square between Pluto and Jupiter shows a tremendous need to expand their lives together. This will be fine if they can work in harmony, but if they try to undermine each other then this square can be problematic. Success and the way the outside world reacts to them can also be a problem. Outside pressures could cause fissures in this relationship, and they will have to learnt to not aim too high and be too ambitious, otherwise the whole relationship could come crashing down around them. The fact that Liam and Miley have been seeing each other for three years shows that there are deep feelings here between them, and the relationship analysis bares this out. I don’t think that this is a one off stunt a la Kim Kardashian/Kris Humphries which was doomed to almost certain failure from minute one. It is also reported that they have split up at least twice before getting back together. I just wonder if this is a step too far too early in their young lives?